← #GettingGorgeous on a Gorgeous Saturday in NYC! Look Mommy I Pulled Out My Tooth! For years Amelia has been wishing for a wiggly tooth. Even as young as two she would insist she had a loose tooth. Many times she would run to me and swear she had a tooth ready to come out. 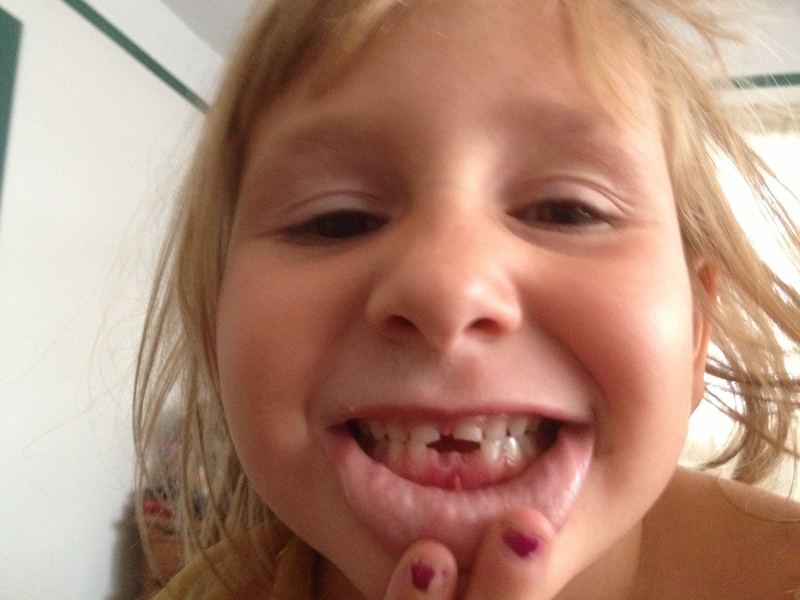 It wasn’t that she cared so much about her tooth falling out it was really about her obsession with the Tooth Fairy. For years she had watched her sisters put their teeth under their pillows at night and wake in the morning to find a dollar. Well mostly they would find a dollar but sometimes they would find nothing. Honestly the tooth fairy in my neighborhood is kind of irresponsible she forgets to come a lot… and a dollar she is a little cheap too. I think she might get fired one of these days. Nevertheless Amelia was thrilled to discover she had a wiggly tooth. She was so excited so of course all she did for days was play with it. She wiggled and wiggled that tooth relentlessly until finally it came out. She was beside herself with excitement and couldn’t wait to put it under the pillow and get her reward from the Tooth Fairy; apparently she was unaware of the Tooth Fairy’s spotty record. Mind you this second tooth was not wiggly at all. My other two kids have had teeth that were so lose they were hanging by a thread and they wouldn’t even let you look in their mouths. This nut pulled out her own tooth! And why you might ask? For money of course! I guess she figured the first one came out easy why not double her earnings. After I congratulated her on her second tooth coming out I had to put a hold on all teeth pulling and made her promise to not pull out any more teeth. This entry was posted in Family, Life, Motherhood and tagged baby teeth, pull out teeth, teeth, Tooth, Tooth fairy, wiggly tooth. Bookmark the permalink. 2 Responses to Look Mommy I Pulled Out My Tooth!